A former assistant football coach at a high school in Titusville, Florida was convicted by a federal jury on February 27, 2017 for his involvement in a scheme to distribute cocaine throughout northern Brevard County. Florida Today reported that the man was arrested last June after a lengthy investigation by the Drug Enforcement Agency and Titusville law enforcement. When he attempted to sell cocaine to an informant in a local Wal-Mart, authorities apprehended the man and found a large sum of money and firearm on his person. Because a gun was involved, a stiffer sentencing arrangement will apply and the conviction could lead to a federal prison term up to 20 years. Armed drug trafficking is a serious offense, especially under federal jurisdiction, so you need a skilled attorney if you’re facing similar charges. Armed trafficking is a charge that’s added to the primary crime of selling controlled substances when there is a gun involved with commission of the crime. The offense is tacked on due to what is considered a higher threat when an offender possesses, exposes, or discharges the weapon. Allegations of armed drug trafficking will increase the penalties upon conviction. Under federal law, the specifics of a drug crime depend upon the weight of the controlled substance when confiscated. 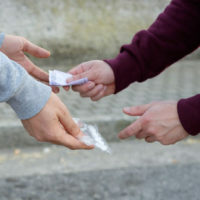 Heroin and LSD: Trafficking in lower amounts of heroin (100-999 grams) or LSD (1-9 grams) is a Class D felony under federal law, punishable by five years in prison for a first time offense. A second offense may carry a sentence in excess of 10 years. If trafficking in amounts higher than those stated, the offense is a Class C felony. A first time offender may be sentenced to 10 years or more, while a second conviction requires a minimum sentence of 20 years. Cocaine: A Schedule II drug under federal law, trafficking in cocaine is also a felony. For amounts of 500-4999 grams, the crime is a Class D felony; five kilograms or more leads to Class C felony charges. If the gun is discharged, the prison sentence is increased to 10 years. You’re already facing serious charges when arrested for drug trafficking, and having a firearm in your possession makes your situation more critical. For some matters, you’ll need a skilled attorney that has practiced in federal court in armed drug trafficking cases. A qualified lawyer knows how the law and procedural rules differ slightly as compared to cases proceeding under Florida statutes, and can use this experience to defend your interests. Fort Lauderdale attorney Kevin J. Kulik has extensive experience representing clients in federal court cases involving drugs and weapons charges, so please contact our office today for a confidential consultation.